"Who never shows a bit of temperament? Who never ever starts an argument?" Donald Duck remains a very popular character for Disney, and it's not hard to see why; his tendencies toward violence and general angry disposition spark something within most people who have felt similar feelings in dealing with the world. Compared to a namby-pamby like Mickey Mouse or the dullard Goofy, there's no comparison. 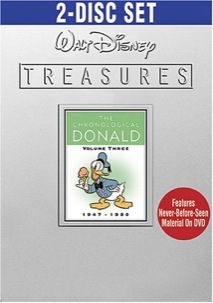 Hence, we now have the third volume of Donald 'toons from the Walt Disney Treasures line, collecting shorts from 1947-50. For collectors, this is a no brainer; if you already have one of these sets, you can probably do without this one, seeing as how the contents serve mainly as a refinement of what's already been done with the character and the format. While the plotlines differ somewhat, one main storyline predominates, featuring Donald causing his own troubles by indulging in deliberate acts of mean-spiritedness toward others, leading to his own comeuppance. You even get Donald using some of the same lines when he puts others through his little jokes, and the formula gets a bit stale. One of the standouts from the pack is Donald's Dilemma, which sees Daisy desperately trying to recover "her" Donald after a head injury turns him into a star crooner. Chip and Dale feature in an Academy Award nominated short named after them, but it doesn't do much that we haven't seen in one form or another somewhere else. Thankfully, Disney have included some of the politically incorrect material in a "Vault" section, which allows us to enjoy smoking, suicide attempts, racial stereotyping, and other frowned-upon comedic standbys. None of it is malicious, and Leonard Maltin is there as always to warn the easily swayed about how none of this should be done at home. The presentation follows the usual Disney Treasures standard, both in terms of disc organization and product packaging, with the usual silly metal tin housing a double case. Honestly, who likes the metal tins? They get easily dented, frustrating collectors, they have no spine text telling you what they are on the shelf, and if you remove the cases to display them, you have to store the tins somewhere else. Pointless, much like paper slipcovers that duplicate the jacket art. Enough already. Otherwise, you get the numbered certificate (this run is 50,000 copies) and the other insert items. Disney knows when to stick with a good thing, I will say that. In the end, if you love Donald, or collect all things Disney animation, you'll certainly want this, as it's Disney's best major character. Image Transfer Review: Most of the shorts are interlaced transfers, which results in a picture that sometimes flickers annoyingly. Strangely, at least one short in the "Vault" section is progressive, and the difference is noticeable. Based on player performance, your mileage may vary on this. Otherwise, the shorts look very nice, with clean, bold colors and minimal damage. The optional yellow English subtitles are of very good quality, even providing subs for Chip and Dale's incoherent speech. Audio Transfer Review: The 2.0 mono track is clean and largely hiss-free, allowing the solid sound mixes to shine. Extras Review: The paper extras are standard for the series; a postcard-sized piece of "collectible art" featuring the poster art for Inferior Decorator, a numbered certificate of authenticity (remember that these are limited editions), and an insert booklet with illustrations, a short note from Leonard Maltin, and a list of the contents of each disc. On Disc 1, we have The Many Faces of Donald Duck (14m:41s), hosted by Maltin, which looks at Donald's appearances in feature films and includes interviews with animation historians and the current voice of Donald. Maltin also provides an intro (24s) to the easter eggs, which are the various openings of The Mickey Mouse Club, which featured different gags with Donald. To be honest, I loathe easter eggs, and frankly can't be bothered to hunt them all down. Most appear to be easily found on menu pages by arrowing sideways, from cursory searches on a couple pages. There are ten in total. On Disc 2, Sculpting Donald (09m:08s) interviews Ruben Procopio, who works for Disney as a sculptor, and he discusses what is involved in making Donald. Finally, both discs include extensive art galleries for the shorts on each disc, grouped in batches of five. The art includes production art and storyboards and are quite interesting to look through. By the third trip to the well, Donald Duck shorts were at the top of their game in terms of technical achievement, but the storylines remain fairly repetitive when taken in large doses. The standard of quality is on par with most of the other Disney Treasures series, so collectors will want to snap this up while still available and avoid paying eBay vultures.